John Krasinski’s A Quiet Place has quickly become one of 2018’s surprise hits, beating out Black Panther in the weekend box office. A Quiet Place, produced by Paramount Pictures, had a $50 million dollar opening, making it the second best domestic debut this year, following Marvel’s early 2018 blockbuster. Currently holding a 97% critic score on Rotten tomatoes, and 87% audience score, the film has seemed to please both audiences and critics, alike. Many attribute the films success to the SXSW Buzz, which created both word of mouth and social media praise. Another reason for its success is the fact that Emily Blunt and John Krasinski are not only married, but both have strong fan bases, stemming from Blunt’s films, and Krasinski’s time as the loveable Jim Harper on The Office. I personally loved the film A Quiet Place, and think that Krasinski did something not many are able to pull off: not only did he perform, but also directed and wrote for the film as well. This is something you rarely see, but when you do, its pure magic. The film was very enjoyable, surprising you within the first few minutes. It’s filled with edge of your seat suspense, and was even loved by the NR team, which you can read here. Another cool thing about the film is that even Deadpool and Guardians of the Galaxy actors, Ryan Reynolds and Chris Pratt, respectively, took to social media, recommending that everyone see the film. HOLY CRAPPP!!!! Stop what you’re doing right now … AND GO SEE “A QUIET PLACE” it’s scary, moving, with amazing performances and a totally original idea. A+++ 97% on rotten tomatoes for a reason. Bring a friend. 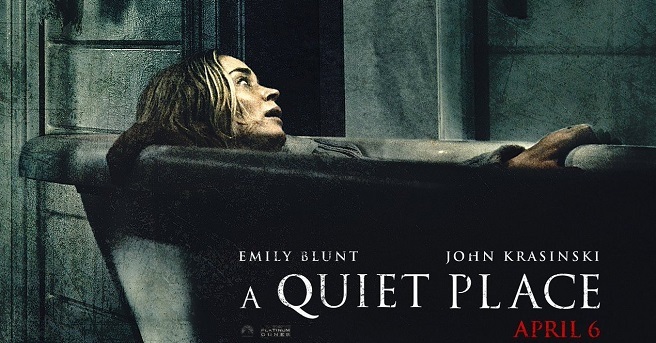 A Quiet Place Synopsis: In the modern horror thriller A QUIET PLACE, a family of four must navigate their lives in silence after mysterious creatures that hunt by sound threaten their survival. If they hear you, they hunt you.